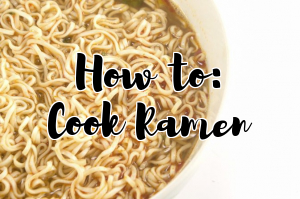 TIP TUESDAY: Cooking Instant Ramen! The Saving Asian Tip from my Dad! :) Normally, we cook the instant noodles by throwing noddles into a pot with water, throw in the powder and let it cook for around 3 minutes... then it's ready to eat. This is the WRONG method of cooking instant noodles. By doing this, when we actually boil the ingredients in the powder, normally with MSG, it will charge the molecular structures of the MSG causing it to be toxic! 2. Once the noodles are cooked, take out the noodles, and throw away the water which contains the wax. 3. Boil another pot of water till boiling, and put the noodles into the hot, boiling water, and then shut the fire. 4. Only at this stage when the fire is off, and while the water is still very hot, put the powder into the water, to make noodle soup. A large number of patients, ranging from ages 18 - 24 yrs end up with pancreatitis either as a swelling or infection of the pancreas due to regular consumption of instant noodles. If the frequency is more than 3 times a week, then it is very hazardous.